In a bowl, combine all of the ingredients except the ice and mint leaves. Mix in batches with the ice in a blender. Garnish with mint leaves. 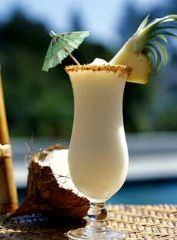 Especially if you have a Pina Colada recipe.